V&SAR Joint stock wooden sleeping car Coliban was built at the Victorian Railways Newport Workshops (by contractors Fowler, Nathan and party) for use on "The Overland". See also V&SAR sleeping cars: Acheron, Angas, Baderloo, Barwon, Dargo, Finniss, Glenelg, Inman, Loddon, Onkaparinga, Pekina, Tambo, Torrens. 7.9.1951 Damaged in "The Overland" head on crash at Serviceton when a bulk mail van telescoped into it. 27.6.1969 South Australian Railways equity brought by Victorian Railways. 15.9.1969 Altered to "Sleeping car No. 7". 1984 Fitted with Spirit of Progress bogies. 6.1986 Being used on the "Train of Knowledge". 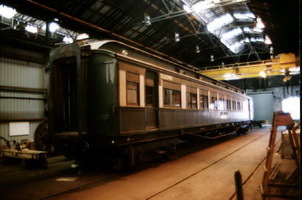 1.2.1990 Withdrawn and purchased by SteamRanger (Australian Railway Historial Society SA Division). - Painted green and cream. This colour scheme was new to the car being based on SteamRangers corporate colours. 1996 Sold to SteamRail Victoria. This page was last updated on Wednesday 3 Jan 2018 at 9:30pm.